OnPage’s Cisco Spark integration is the perfect tool for enterprise communication, allowing the user to add critical, time-sensitive, messaging capabilities to the communication channel. All your files and conversations are in one place with Cisco Spark and so is the time-stamped audit trail of the communication with OnPage. Messages are accessible securely through the cloud on your devices. Cisco Spark allows you to message, commence video calls and even share your screen. The Cisco Spark Integration is easy. 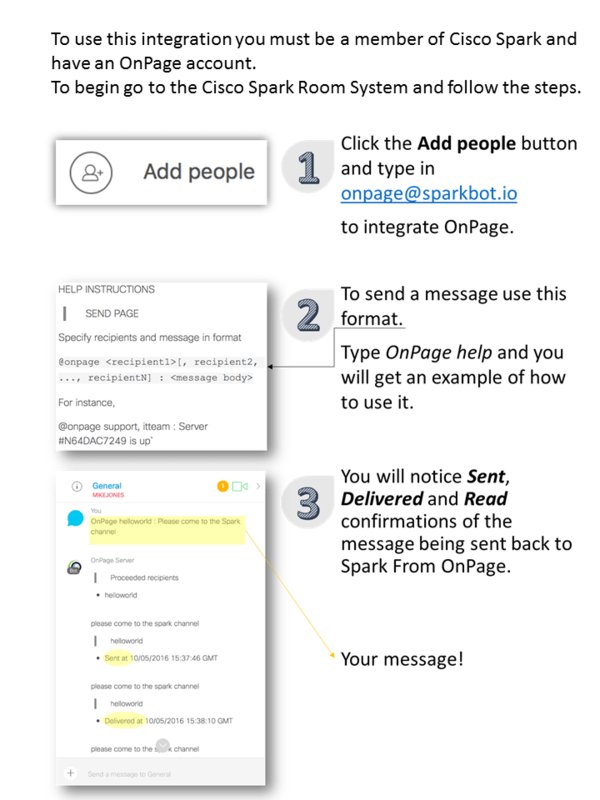 To integrate Cisco Spark with OnPage follow these simple steps. Contact us to learn more about bringing Cisco Spark’s capabilities to your IT team.